I was disappointed. Unwind was such a well written and developed book so I had extremely high expectations for this. UnWholly takes off with a boy named Starkey, he's heard of the Akron AWOL and he thinks that he is dead from what he heard in the media. I had a mini hearth attack reading that but it's alright! False alarm. Starkey is annoying. I could just stop there because its just the plain truth, but let me elaborate. He fools Connor, is single minded and is horridly sensitive. Not exactly what I call a likeable character. Conner, Risa and Lev, our main characters, are the most thoughtful and strongest characters in the book, so many actions they make are unthinkable yet so intriguing. 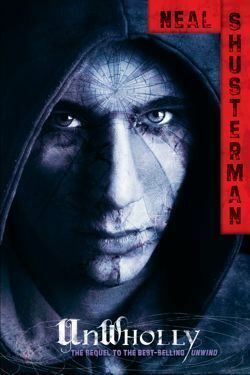 It's really hard for someone to right with several protagonists, I counted at least 10 different ones, Shusterman really knows how to right with large amounts of POV's. unlike some other books, these different POV's really take advantage and make the audience feel more enticed. The romance was quite lacking, Connor and Risa barely made any interaction which made my heart ache. UnSouled BETTER give me more romance because I was expecting all when diving into the book. I may as well admit now that I found it fairly hard to get into UnWholly. Taking me 5 days is really slow for me and I was surprised how quickly I finished the last 230 pages all today. This shows that the first 170 pages were boring and slow for me. Unwind lovers, after your long wait, UnWholly has finally come so get prepared to be grossed out at the creepy parts and adoring some of our main characters. Sign into Goodreads to see if any of your friends have read UnWholly. 26.12% "Risa and Connor are so gorgeous and frustrating!" 41.29% "What is it with Nelson and wanting other people's eyes?! Revolting! I fell like I'm stalling in this book, so far I've read 3 books while reading this. Tsk tsk..."
56.47% "Risa is such a likeable character"
85.32% "Aww... Crud I don't like the sound of this"
92.29% "This reminds me of Everlost and that isn't good."